Transit riders who didn't manage to snag one of TransLink's new Compass Wristbands Monday morning will probably have to wait until February to get one – unless they're willing to shell out money to a scalper. 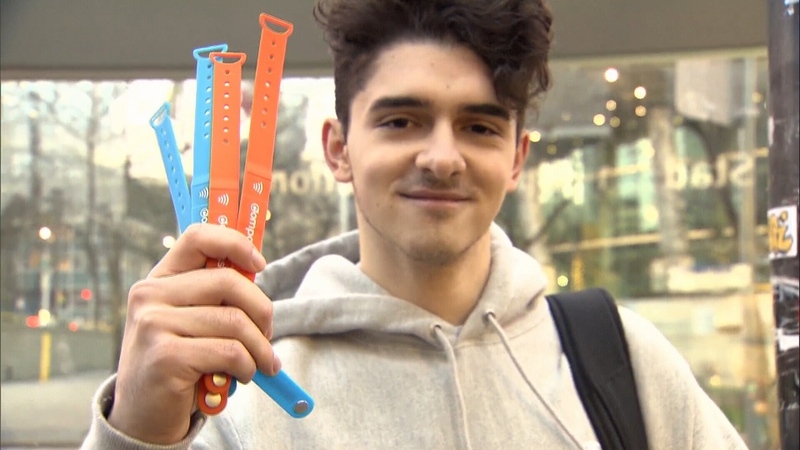 Just a few hours after TransLink sold out its first batch of the wearable fare bracelets, a number of people started advertising the "super limited" items on Craigslist. But while TransLink only charged a $6 refundable deposit for the sought-after Compass Wristbands, one Craigslist seller demanded 10 times that much. Another asked potential buyers to send in their "best offer." Only 1,000 blue adult wristbands and 1,000 orange concession wristbands were made available Monday, which is not a lot considering there are about 500,000 riders who use the system daily. The transit provider estimates it will take about two months to get more from the manufacturer in Germany. People ended up queuing up down the block when the wearable technology went on sale at 7:30 a.m., and it only took about three hours for TransLink to sell out. "I've gotta say, this is a little more than we expected," spokesperson Jill Drews said. "But it's great. We're glad people love the wristbands." The wristbands function the same as Compass Cards, using an embedded chip that allows riders to tap in and out of TransLink's system. The transit provider has billed them as a good option for passengers with disabilities, as well as anyone who simply prefers not to dig through their bag, pocket or wallet for their fare card. The benefits were clear to Ricky Campbell, who was the first person to line up for a Compass Wristband at the Stadium-Chinatown SkyTrain Station on Monday. "I use a cane so it will be easier for me to use a wristband instead of having to juggle stuff," said Campbell, who arrived about 90 minutes early to ensure he was able to get one. 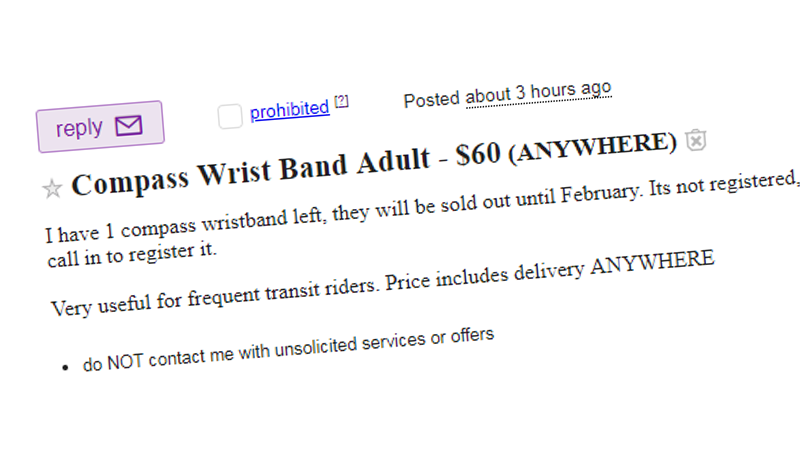 Hours after TransLink's Compass Wristbands sold out, sellers are advertising them for as much as $60 on Craigslist. A transit rider holds up some of TransLink's new Compass Wristbands at the Stadium-Chinatown SkyTrain Station. Dec. 3, 2018.